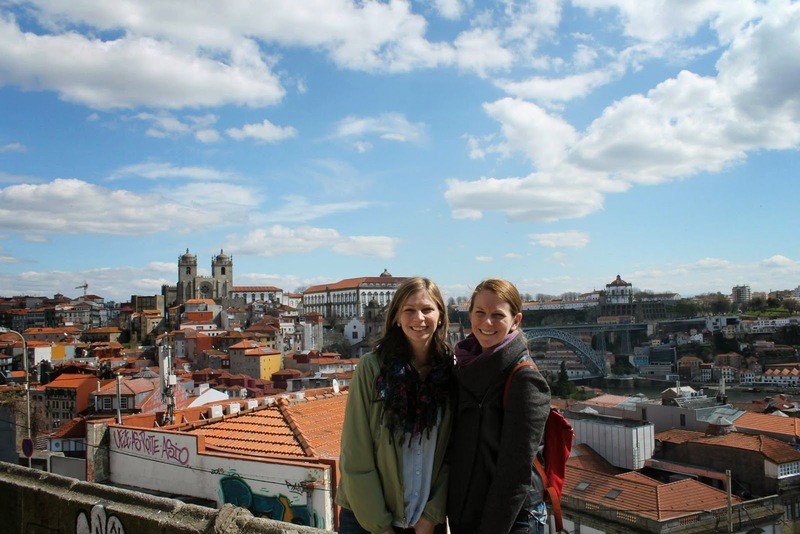 I didn't know much about Portugal before my sister and I decided it would be the next country we'd tackle together. We were originally planning on just traveling to Lisbon (which was all yellow). As I started to tell people about our potential plans, two of my coworkers repeatedly pushed me to look into Porto. As Katie and I did more research and saw how cute the town was and how much it had to offer, we added a few more days to the trip so that we could fit in another stop. A definite highlight of our time in Porto was our experience with Taste Porto Food Tours. Andre, our amazing guide, not only showed us around the best eateries and gave us the best food in Porto, he also gave us a tour of the city, language, culture, and the history. Andre took us to the best views, the trendiest 'hoods, and pointed out his five favorite tiles in Porto along the way to our tasting locations. We started off with breakfast at Loja dos Pastéis de Chaves. This bakery sells pastries from the city of Chaves, north of Porto. In order to be dubbed a Pastéis de Chaves, it is regulated that the pastries must be made with the original recipe from Chaves. This particular pastry is made in Chaves every morning and delivered to five shops around northern Portugal. While the veal is the only pastry that can be designated as a Chaves pastry, this shop creates several varieties each day, including chicken, codfish, and dark chocolate. Although veal may be an odd thing to have for breakfast, I actually enjoyed it even more than I liked the dark chocolate pastry, which would be my typical go-to. The next stop was Bolhão Market. We walked by flower, fruit, vegetable, butcher, and bread stands and sat down at Bolhão Wine House, which used to be the owner's grandmother's flower stand. The owners renovated it, turned it into a hot spot, and inspired other vendors to do the same which has revitalized the market, around since 1850. Andre called Bolhão Wine House's rebirth a tipping point for the entire market. I had an "oh crap" moment when I learned we were going to be eating sardines because I'm not a fish-fish person (but I am a huge shellfish person). Canned fish are big in Portugal so I knew we'd have some along the way. The sardines were covered in tomato sauce and we ate them with the best olive oil I've ever had and some great bread from another stand in the market. I was glad to have tried them, but only ate a little as I thought I'd save my appetite for something I really loved. We also had a sweet cheese pastry and a very very very sweet muscatel wine, made with grapes that are only found in the Douro Valley in Northern Portugal. I'm not much into wine, as you'll discover more about when I write about sampling Port, so I had a few sips and discreetly passed mine along to Katie. Our lunch was my favorite stop of all and maybe my favorite meal in all of Portugal. As soon as we walked down the quaint street that contained Flor dos Congregados, I knew this was the reason why we came on the food tour. When we walked in, it felt like we were in a cave because it was so dark and cozy. I would totally live in a cave. This restaurant has been open for 160 years - 'nuff said, this was the real deal. We were served a few different wines, which I tried but also gave up to Katie. My mission was the Congregado sandwich that Andre kept raving about. This sandwich was one of the best I've ever had in this old belly of mine - and you know how much I like sandwiches. The roll is sliced twice - how have I never seen this before?! - with separate sections for the pork loin (marinated for over twenty hours and slow-roasted for over three) and the smoked ham (aged for 24 months). Next after walking around town for a bit, we stopped for a dessert of lemon and chocolate éclairs in the sunshine at Leitaria da Quinta do Paço, open since 1920. Although it was slightly windy and therefore I got lemon icing in my hair because I am who I am, Katie and I loved the éclairs we had - so much, in fact, that we took advantage of the shop's proximity to our hotel and ate our afternoon snacks there two days in a row. Throughout our additional visits, we were able to sample mixed berry, apple, dulce de leche, and chocolate mint éclairs. I think the lemon remained my favorite. Our last stop was at the adorable Taberna do Largo, a wonderful little shop where everything is sourced from different towns within Portugal. It was here we had a feast: more wine (some of which I actually finished), various cheeses (from cows, sheeps, and goats), breads, hams, and sausages from different Portuguese regions that were cooked on a tabletop grill right in front of us. If you find yourself in Porto, you must must must take a Taste Porto Food Tour. Not only was it a generous sampling of the variety of delicacies that Porto has to offer, it's also the best way to get acquainted with the entire town. Go ahead, do what we did and add a few days onto your European vacation to explore Porto. You won't regret it. You can also feel free to bring me along. I need more of that Congregado sandwich, stat. Obrigada (Thank you) Taste Porto Food Tours for the special rate and the fantastic experience. Tours are traditionally €59 for adults; €40 for children under 13. Opinions are always my own.